In the early nineteenth century, travel to and from Kemnay to Aberdeen was by Stage-Coach called ‘The Banks of Don’ which travelled between Inverurie and Aberdeen. To catch the Stage-Coach you had to walk the Four miles to get to the Inverurie – Aberdeen road. The road from Kemnay to Aberdeen did not follow the route of today, but went from the Pleasure Park up past Leschangie rejoining the road of today at Cotton about two miles east of Kemnay. By the 1840s the road by Leschangie had been superseded by present day road system to Kintore which was laid out in mid 1820s. In these early days Parcels and Goods were delivered to Kemnay by a Local Carrier James Mitchell who could have been seen setting off early in the morning, winding his way round past Leschangie and slowly making his way up the Tyrebagger Hill on his way to Aberdeen. He would usually make his way back the following day laden with goods bound for Kemnay and the surrounding area. James Mitchell could neither read nor write, but he had a good memory and with the careful placing of goods on his cart could deliver them in the most part without error. James Mitchell was characteristically dressed in Cord Knee length Britches, Broad Blue Hat and Knee length Boots. The family name Annand has been associated with Kemnay since the early 1800s. James Annand was born in 1793 and married Christian Barnett in Bogfur on 26 April 1821. Of their family of eight two especially catch our attention. Rachel, born in 1825, married William Stevenson and their daughter, Barbara, married John Fyfe the well known quarrymaster; John, the youngest born in 1842, was an engineer at the quarry and built the house ‘Killarney’ on Aquithie Road. Joseph Annand (born in 1821) married Isobel Mitchell on 24 February 1842 in Kemnay (the marriage was also registered in Inverurie on 15 March 1842). Sadly we know nothing of Joseph’s parentage as his son-in-law was unaware of his parents’ names when he registered Joseph’s death in 1910. The one member of Joseph’s eight children who left any mark on the countryside was his son Joseph, born in 1852. In 1881 Joseph jr. and his wife Elizabeth Middleton were in the merchant’s shop at Pettymuick, Udny. A proud and somewhat eccentric gentleman, Joseph later had a greengrocer’s shop in Holburn Street in Aberdeen on the site of the present day Trinity Hall. He settled in Kemnay, buying the house now known as Birkenshaw, following the death of George Proctor’s widow. He renamed it “Annands Villa” having the letters set into the entrance gate. He commissioned the large granite memorial in the top section of the churchyard and it was erected several years before he died. 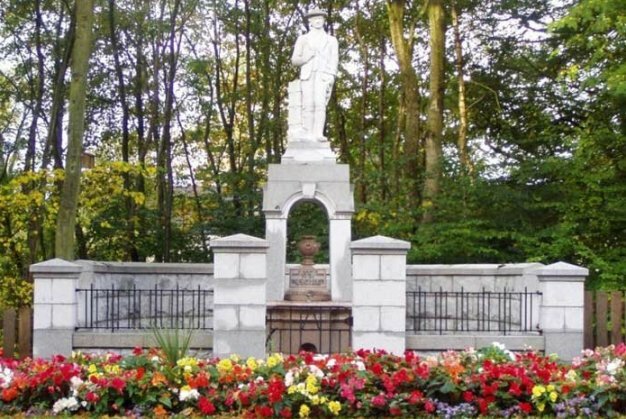 Maybe more to Joseph Annand’s credit is the fact that it was he who commissioned and erected (in 1937) the statue of James Mitchell nearby the war memorial in the village. James Mitchell was born in 1773 and for many years acted as carrier for the area, travelling into Aberdeen on Thursday, staying overnight in Harriet Street and returning home on Friday. In an article in Kemnay Bazaar Book (published 1896) headed “Recollections of Kemnay fifty years ago” we read; “… This carrier, by the way, was rather a ‘character.’ With his cord knee-breeches, homespun clothing, broad blue bonnet and ‘boothose,’ he had quite an up-country look. He could not read hand-writing, but by the help of a good memory, and the setting of the goods he carried in methodical order in his cart, he managed to execute his commissions with wonderful correctness.” An image of the carrier appeared alongside the article and it was on this image that the statue was modelled. James Mitchell carried on his work right up until the year of his death (1857).